Large cog with the Latin sail aft and by light gun on the turning ring mount which ruled in the Baltic region and the North Sea almost 300 years. The galley, be it of Greek, Roman, Byzantine, Arab, or Turkish design, was not an effective seagoing weapon system. 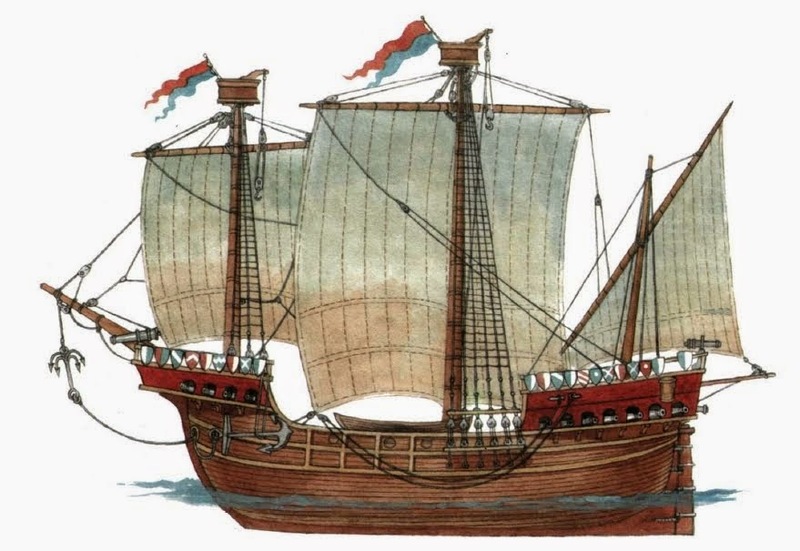 Galley fleets were too unseaworthy and too logistically short-legged to act independently. As a result, well into the sixteenth century Mediterranean navies were still tethered to the shore. Galley fleets had limited radii of operations—five hundred miles at best—and that piloting along coasts, not sailing or rowing along a straight line from point to point. At night, galley commanders preferred to back their ships onto a safe beach, where the crew could sleep and search for fresh food and water. A blockade of a distant enemy port was virtually impossible. Only if a friendly army held a nearby stretch of coast could a galley squadron attempt a blockade. Navies, leashed as they were, usually operated as flanking forces for the armies to which they were attached. Until the sixteenth century, naval operations were extensions of land warfare, more amphibious than truly naval. That Europe’s maritime empires all fronted the North Atlantic, a harsh, challenging sea, was no coincidence. Northern Europeans were never as enamored of the galley as their southern cousins. Northern seas, even coastal waters, were too rough for vessels with low freeboards. Many of the tides and currents of the English Channel ebbed and flowed more quickly than the best speed of a rowed vessel. The Vikings conducted most of their distant oceanic voyages, not in their rowed longships or war galleys, but in more functional sailing vessels. The harsh Atlantic environment forced northern Europeans to give more thought to the design and rigging of sailing ships, and to navigation techniques, than did the people of the Mediterranean basin. Often facing overcast or foggy conditions, northern mariners relied heavily on soundings and, when it became available, the compass. Eventually northerners developed several types of vessels notable for their seaworthiness, carrying capacity, range, and ability to sail upwind. Northern shipbuilders enjoyed no monopoly on design improvements. Shipwrights in the Mediterranean also refined their roundships, not only by incorporating ideas imported from the north, but also through their own advances in construction techniques and rigging plans, advances northerners were more than ready to adopt. Shipbuilding know-how flowed freely between the Atlantic and the Mediterranean. Northern Europeans owed their maritime dominance over their southern neighbors, and ultimately over the entire world, to a pair of interrelated developments. First, northerners quickly adopted, by necessity rather than choice, improved roundships as war platforms; the Mediterranean states, both Christian and Muslim, did not. Second, the northern Europeans’ continued refinement of the sailing man-of-war in the fourteenth and fifteenth centuries positioned them, unlike their southern neighbors, to take full advantage of the development of cheap iron cannon late in the sixteenth century. Since the galley was never as satisfactory a platform for ship-to-ship fighting in rough northern waters as in the Mediterranean, as shipwrights constructed larger, more strongly built, more maneuverable roundships in the thirteenth century, states fronting the Atlantic began to incorporate the new vessels into their naval forces. The late-twelfth-century English navy, for example, consisted principally of assorted types of galleys, but by the early thirteenth century powerful roundships formed the core of English battlefleets. By the early fourteenth century galleys had all but disappeared from English orders of battle. In contrast, well into the sixteenth century Mediterranean navies clung to their battleproven galleys, which continued to hold their own against roundships. As a result, northern shipbuilders had a three-century head start, not in the design and development of sailing ships as such, but in the refinement of the roundship as a fighting platform. While most sailing ships taken into the fleet in wartime were merchant vessels pressed temporarily into service, northern European states began to look to shipwrights to design and build sailing vessels specifically for wartime use. These new ships incorporated several prominent design features, such as towering fore and aft “castles,” or fighting platforms, from which soldiers could hurl projectiles down onto their enemies. Gradually, the recognizable design of purpose-built sailing warships began to emerge. Nevertheless, these early sailing men-of-war, even when armed with the primitive gunpowder weapons of the day, did not yet ensure technological superiority for northern navies beyond their home waters. Until the sixteenth century reliable cannon were too expensive to be used extensively, whether on land or on sea. States generally consigned their heavy guns to siege trains, of which the Muslim Ottomans, not the Christian Europeans, had the most powerful. Navies, both northern and Mediterranean, mounted only small numbers of heavy cannon, mostly brass or bronze, in the bows of their ships. The costliness of the great guns masked the true nature of the technological changes taking place in the maritime world and lulled the Mediterranean powers into unwarranted complacency. As long as fiscal concerns limited the naval use of artillery, the galley was a viable fighting platform. Since bow-mounted guns fired forward, in battle they could be used more efficiently by the highly maneuverable galleys than by sailing ships. Thus in 1500 no one recognized that the war galley had reached the end of its long history of development; no one foresaw that the fighting roundship would continue to evolve as a weapons system for another 350 years; no one knew that by the end of the century the advent of cheap iron cannon would allow the larger, longer-ranged roundship to carry powerful broadside batteries to the four corners of the globe; no one suspected that the age of galley warfare was drawing to a close. Cannon and sailing ships consummated their marriage unobtrusively. Only in the fifteenth century did ships begin to mount guns broadside. Not until 1501 did a Frenchman cut gun ports in the hull of a ship. Only a few men-of-war, such as the English Harry Grace à Dieu and the French François, mounted large batteries with numerous broadside cannon. And of the Harry’s 141 guns, only 21 were heavy cannon, all brass and rather expensive. In the late sixteenth century the development by the English of cheap cast-iron cannon began to ensure the preeminence of the roundship over the galley. Cast-iron cannon weighed more than brass or bronze guns, did not last as long, and were more apt to explode. But new casting methods enabled English ironsmiths to produce large numbers of admittedly inferior but very inexpensive cannon. The use of both English methods and iron guns quickly spread throughout the navies of the north. As a result, northern Europeans possessed a monopoly on both the raw materials and the technological know-how to furnish enough guns to line the decks of their ships of war. Early in the seventeenth century the Mediterranean powers discovered that their navies were obsolescent, if not obsolete. Refinements could no longer make the galley a viable warship. The southern Europeans, Turks, Arabs, and the rest of the world had fallen behind the northerners, so quickly, so imperceptibly, and so far. This entry was posted in Cog, Ottoman, Sail by MSW. Bookmark the permalink.